Here's a charming story about a little prince who falls to earth from Asteroid B-612. What kind of little prince is he? He's a lonely little prince. He's in need of a friend, and so he sets off on a journey across the planets to see who he can find. 'What are you doing here?' he said to the drunkard whom he found sitting silently in front of a collection of bottles, some empty and some full. 'I am drinking,' answered the drunkard lugubriously. 'Why are you drinking?' the little prince asked. 'In order to forget,' replied the drunkard. 'To forget what?' enquired the little prince, who was already feeling sorry for him. 'To forget that I am ashamed,' the drunkard confessed, hanging his head. 'Ashamed of what?' asked the little prince who wanted to help him. 'Ashamed of drinking!' concluded the drunkard, withdrawing into total silence. 'Grown-ups really are very, very odd,' he said to himself as he continued his journey. 'They do not find it,' I replied. There are many ways to read this book. 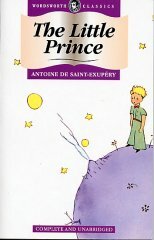 You can take it as a straight-forward story about a charming little prince who wants a friend, or you can think more deeply about the way the little prince chooses to live his life. It's a very sad story, too.